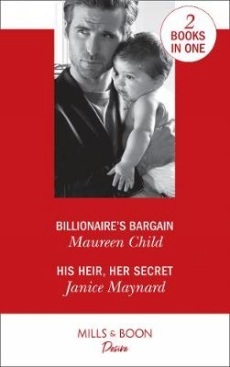 Billionaire's Bargain by Maureen Child When Adam Quinn becomes legal guardian to his late brother's baby, he's in need of reinforcements. Enter Sienna West the one-time wife of Adam's brother who swore off Quinn men. But now Sienna can't deny the desire in Adam's gaze... His Heir, Her Secret by Janice Maynard For two glorious weeks, Cate Everett shared Brody Stewart's bed. Four months later and the seductive Scotsman is back in town. Will she be living a loveless sham or will he throw his heart into the bargain?